Like the rest of the digestive tract, the appendix is made of an inner layer of mucosa with submucosa, muscularis, and serosa layers surrounding it. Unlike the rest of the large intestine, however, the submucosa of the appendix contains many masses of lymphoid tissue. The presence of lymphoid tissue suggests that the appendix may play a role in the immune system in addition to the digestive system. 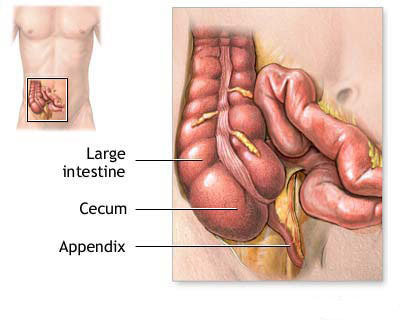 Doctors typically remove an appendix if it becomes inflamed, and even a healthy appendix may be removed during abdominal surgeries such as a hysterectomy. A doctor's justification for this removal is that the appendix is susceptible to bacterial infections that lead to appendicitis, a fairly common and dangerous inflammation of the appendix. Often one of the first signs of appendicitis is pain and tenderness near the navel, often growing sharper and spreading downward into the lower right abdomen. The pain can grow quite severe over the course of a few hours, so much so that it may be impossible to get comfortable or to move without pain. Applying pressure to the area will commonly cause pain that can sharpen after releasing the pressure (a phenomenon called "rebound tenderness"), though this is not always the case. Additional common symptoms include nausea, vomiting, fever and others.